Such is the state of real estate in New York City that there is no shortage of homes of every size and stripe upon which you could drop $10 million. And though the ask may seem relatively ambitious for a single-story residence, this particular listing at 455 Central Park West doesn’t need to reach far for the adjectives required to command such an outlay (Just for starters: It looks like a fairytale castle). And while the Manhattan Valley location may be a little “far uptown” for some late-to-the party folks, its village-y vibe is getting lots of love of late, and, really, Central Park West is Central Park West. 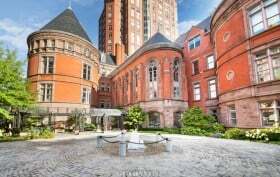 Between the amazing architecture and fascinating–if somewhat macabre–history as the former New York City Cancer Hospital, 2,360 square feet of space including two enormous circular opposite wings, private courtyards, and a peerless menu of building amenities including a pool, spa and drive-up entry courtyard, very few boxes remain unchecked in this unquestionably unique four-bedroom condominium.